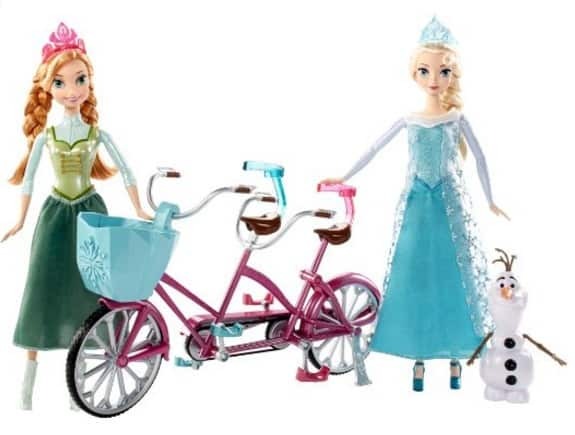 The Disney Frozen Anna and Elsa's Musical Bicycle Playset is on sale for $24.49 at Amazon right now. That's 30% off the list price of $34.99! Join your favorite Disney Frozen characters for an enchanting bike ride on their new tandem bicycle! These friends are ready to pedal to their next adventure! With household brands like Barbie, Hot Wheels and Fisher-Price, Mattel has been at the helm of creating fun and adventure for children since 1945. The company, started by Harold “Matt” Matson and Elliot Handler, believes in the importance of play in a child's life and reinforces that with every Mattel toy.